I was looking for a suitable quote to kick-start this blog on some eco-construction stuff. 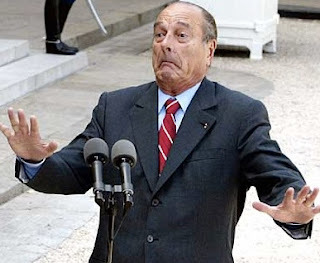 I didn’t find anything I liked for the context I wanted but, with Europe in financial chaos, I thought this ironic, coming as it does from a ex-president of France (’95 to ’07) currently on trial for corruption during his time as mayor of Paris. The trail is taking place in his absence as the poor dear is suffering memory lapses and is too unwell to attend. I avoid political ranting on this blog, which is meant to be an easy-going chronicle of our stumbling progress on our Breton permaculture smallholding, promoting our holiday cottage for rent but it’s hard to ignore what’s going on in Europe and the rest of the world at the moment. 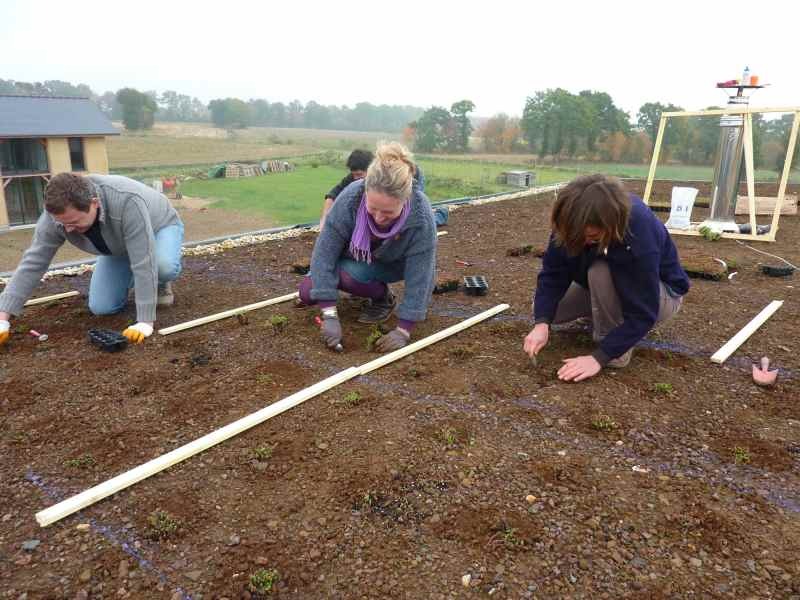 We’ve got a nascent ‘Transition Town’ group not far from us and I’ve offered to get involved, so I’ve just re-read Part One of The Transition Handbook: From Oil Dependency to Local Resilience by Rob Hopkins. It’s reminded me that, in comparison to the twin, linked threats of peak oil and climate change, our current economic woes pale into insignificance. However, our politicians once again fail to rise to the challenge and can only exhort us to throw away stuff that still works (such as your car) and buy morestuff, stuff we don’t really need and which consumes valuable energy and resources to manufacture and transport. 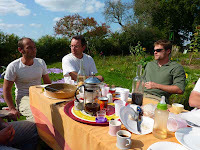 By the by, we had a climate change activist and his son come and stay recently, on their cycling route from the port of St Malo to the south of Brittany, where they are going to start a community farm project. 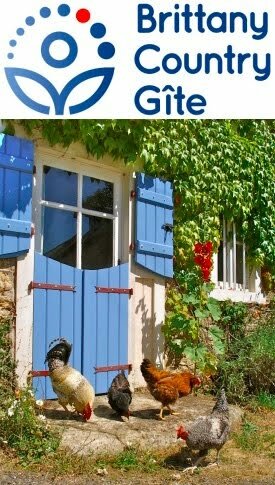 With the gite booked, we had them in our house and decided not to charge: the idea of freely giving weary travellers shelter and sustenance seemed satisfyingly human. After dinner he asked if we could watch the English TV news and I had the strangest experience of looking at John Jordan on the television being interviewed on BBC’s Newsnight and turning to see the same head sat in our armchair watching himself. all work and ... a large lunch ! I firmly believe that one shouldn’t rant about problems without offering helpful solutions, so my advice to European governments is to ask their peoples to start looking down the backs of their sofas to see if they can find any lost change. It’s seems the ever-efficient Germans have been the first to do this, ‘finding’ an amazing 55 billion euros they didn’t think they had. Start pulling those cushions out! … and to finish off with some eco-construction : work on the barn continues (update soon) and we’ve also been helping out friends. 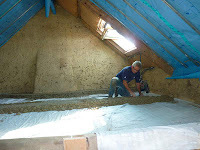 Bruno and Audrey have a very uneven but solid wooden floor in their attic, which will become their bedroom. 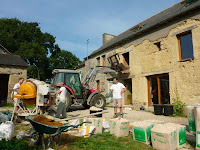 Audrey’s dad, Didier, was maitre d’œuvre for the day and Bruno and several friends and neighbours (me included) mixed and raised up by tractor and buckets, a porridge of hemp and lime for Didier to level. 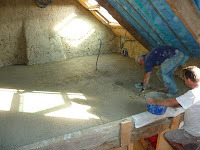 This light but strong eco-‘concrete’ sets hard over a month or so and consolidates the floor, leaving a flat surface. The beautiful old oak boards remain in place as the ceiling of the rooms below. Why ‘eco’ ? Lime is produced at a much lower temperature than cement (less energy) and absorbs CO2 as it dries/cures. Hemp is a bit of a wonder plant and requires no chemicals during its cultivation. 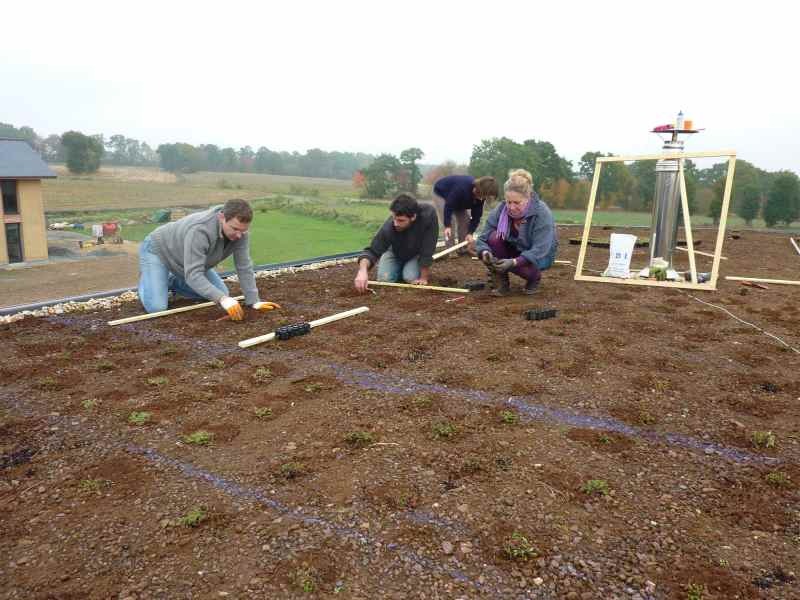 We’ve also helped Bruno and Mélanie top off their straw bale house with a green roof. 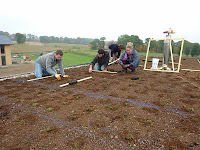 Another convivial team effort, we planted hundreds of sedums into a substrate of earth and pouzzolane (volcanic rock). Our influence was to tell them about famous English gardener Gertrude Jekyll’s ‘drifts’. The idea is to plant large, smooth edged clumps of similar plants together in a satisfyingly uneven drifts. I’ll post more pics next summer, when the plants have expanded to fill the gaps and come into flower. 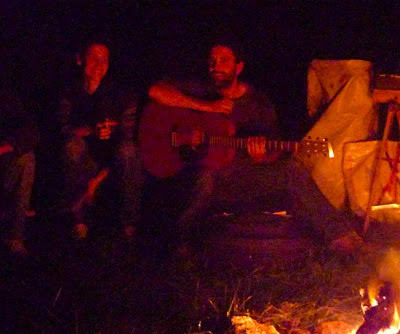 Helping French friends out is always a pleasure, particularly as good food and wine is inevitably implicated along with music round the bonfire on the green roof day. We’re awaiting the arrival of the first of this season’s winter volunteers later today. Andrew and Sue came for a week last year but have booked for two this time … we’re clearly not working them hard enough! We thought we were doing well here in Ireland when it was announced that they had found 3.5 Billion. We hadn't heard about Germany's windfall.